But why even ask the question? Once again, radical claims by Cook’s Illustrated could not go untested. Cook’s Illustrated #99 had the gall to suggest that one could cook crispy, creamy french fries in just six cups of oil. If six cups of oil sounds like a lot, consider that usually when making fries at home I use at least 3 quarts—that’s 12 cups—of oil. The reason for all that oil is temperature control: trying to retain enough heat in the oil so that adding a bunch of cold potatoes doesn’t cause the temperature to drop for very long. Temperature control is the key to great fries. 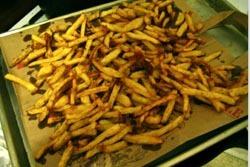 Cooked first at 325° for tenderness throughout, fries are finished at 375° for golden, crispy exteriors. Adding a pound or two of 75° potatoes can drastically reduce the temperature of the oil, so the more hot oil the better. In my restaurant days, I remember lovingly adding 70 pounds of oil to the fryer every Monday morning. Nothing you could drop in there was going to lower the temperature by much. Sometimes I dream of that fryer. How did Cook’s propose to cook 2½ pounds of potatoes in such a small amount of peanut oil? By eschewing specific temperatures all together. In this recipe, ¼” matchsticks of yukon gold potatoes (I usually make fries with russets, but those are apparently too starchy for this technique) are added to six cups of room temperature peanut oil in a dutch oven. You then turn the heat on high, and after five minutes the oil will be bubbling happily. 15 minutes later the fries will have reached the state that is achieved by the usual 325° parcooking step: the fries are limp and blonde but cooked through. Cook’s promised that after an additional five to ten minutes cooking, the fries would be golden and crispy. I waited five minutes. Still limp. Ten minutes. Not much goldener, not much crispier. Fifteeen minutes. My steak was getting cold. 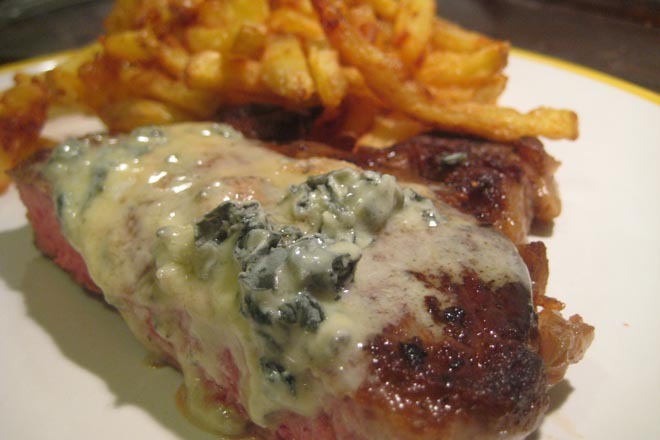 It took a full 17½ minutes of additional cooking (for a full cook time of 37½ minutes, which is not that far off the mark from normal fries if you consider the time to heat the oil). I should probably mention here that the small stove in my apartment is seriously weak on BTUs and it’s quite likely that this prolonged the cooking time. But if BTUs and temperatures were going to be a factor, Cook’s could have gone to the trouble of listing specific temperatures. On draining the fries I was disappointed to see that many of them had broken into stubby fragments. In spite of their short length, the fries tasted fine. They were a little too crispy and not creamy enough in the center—probably a consequence of the long cooking time and the relatively low-starch potato. They weren’t terrible fries, but they weren’t that great either—I have gotten much better results in terms of appearance, flavor and texture using the traditional two step method and more oil. And even though they used only six cups of oil, that’s still kind of a lot of oil. If I’m going to go to the trouble, I’d just as soon use the 12 cups and make fries the right way. As excited as I was by the possibility of fries with less oil and less hassle, sometimes making a bigger mess is worth it. Especially if someone else has to do your dishes. This entry was posted by Tom on Friday, June 12th, 2009 at 10:21 pm and is filed under Technique. You can subscribe to responses to this entry via RSS. Sara Roselli had better luck with this method than you did. It helps that she has a Wolf stove. Could that be the difference? I think the heat output on my stove was definitely the issue. I don’t have a problem doing fries in the two step method because I can wait for however long it takes for the oil to get to the appropriate temperature; the Cook’s recipe didn’t mention temperatures but must have assumed the kind of stove most people have at home, not a tiny apartment model. I guess I’ll have to sign up to be a recipe tester and stand up for the little guy! Found your site from a link on Door Sixteen. We just made these fries this weekend. We have normal sized gas stove in our apartment. We had the same issue. Fries very crispy but fell apart into small chunks. The fries that stayed together were awesome, but most were exactly as you described. We did notice that they benefited from about 3-5 minutes of rest. That really crisped up the last soggy ones. Maybe if we cooked them less next time, and relied on this rest to crisp rather than waiting until they were crispy in the oil? Anyway, i am with you on wishing they gave temps. That is why I like the CI mags so much is all the detail they usually give. Anna—now that you mention it, I did notice that the fries were crispier after resting (while I put the steaks on plates). Basically that makes it really hard to judge when these things are done! I think specific temperatures would definitely help.